The best hitters use the position of their back foot to anchor their approach and help them stay on the ball. They still get off their back side getting their weight into the ball but it’s a little more conservative when you stay sideways. 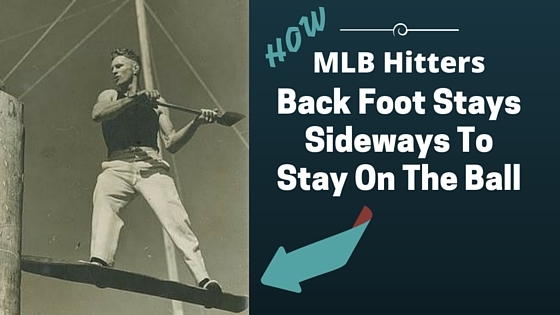 Hitting in the Major League is challenging to say the least, and you’ll find that most of the time, possibly 75% of the time, MLB hitters keep their back foot sideways to help them stay on the ball. For all hitters, it’s fair to say that a key component to being on time is transferring on time. 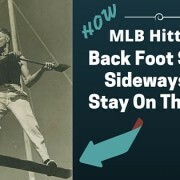 Having said that, we always want to transfer off the back side but it’s a matter of degree, and depends on how well you’ve timed up the pitch and when everything is perfect and you know it, an experienced hitter can commit fully, and will go ahead and get completely off the back side during the transfer but theirs always a risk of losing a little control, then again, if your timing is locked in you know you can get away with it. I’d like to point out that when you do on occasion get fully off the back side and successfully drive the ball, the back foot will get turned because there’s no weight on it, your core is firing aggressively and it may look like you’re turing that back foot on purpose, but the fact of the matter is…you’re not turning the back foot…it’s getting turned. We all transfer off the back side to get our weight into the ball, but due to timing issues, and the sheer will to stay on the ball, you’ll see MLB hitters keep that back foot sideways the majority of the time, often into their finish. There will always be occasions when your timing is so good that you feel the urge to transfer more fully, getting all your weight into the ball, but the fact of the matter is, you don’t need to get your back foot all the way off the ground to hit the ball 450-500 ft, it’s more important to direct your force efficiently and accurately. You can get all the weight you need into the ball and still keep your back foot relatively sideways, which helps you stay on the ball. Remember, as your power increases, you get more weight into the ball, but there’s a chance your power will decrease if you lose control in any of your critical systems:Timing, accuracy with the barrel, and over all timing, drawing power from a lot of sources and directing into a fine point. By keeping a little pressure between the legs, you’ll see hitters keep that back foot sideways and at the same time put plenty of weight into the ball…what they ultimately gain is control and that’s the name of the game when you get to the higher levels. Virtually everyone at that level has power, the art becomes controlling your direction of force.